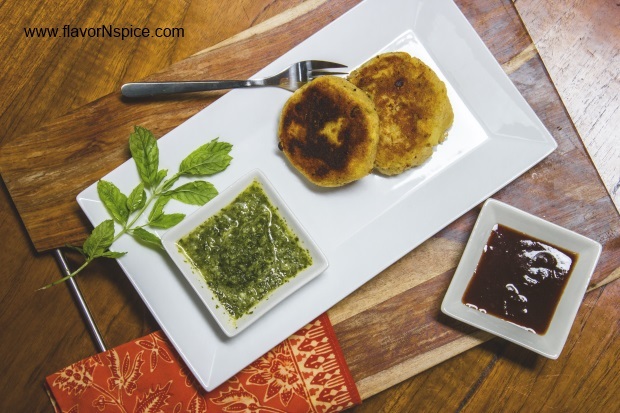 Indian potato pancakes (or Aloo Tikki as they are known in India) are the ultimate in comfort food for me but since they are usually loaded with carbs and don’t have any protein in them, I feel awfully guilty eating them (as they are tantamount to eating completely junk-food in India). Also, most Indian deep fry them, which also means that they are loaded with fat. But I do have to confess they taste absolutely amazing – after all who doesn’t like fried potatoes? However today I felt less guilty making (and of course eating) these yummy treats because I stuffed them with cooked lentils (which meant extra protein, fiber and texture) and instead of deep frying them I pan fried them with extra virgin olive oil. So in all they turned out as delicious as the original Indian treat but there was far less guilt involved in eating them. 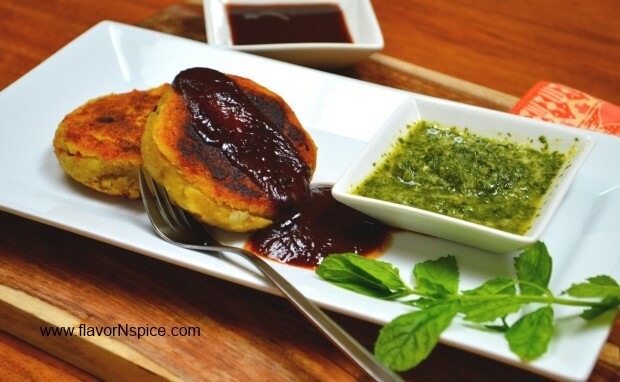 I served them with a fresh Mint-Cilantro Chutney and also a sweet Tamarind-Date sauce. 1. 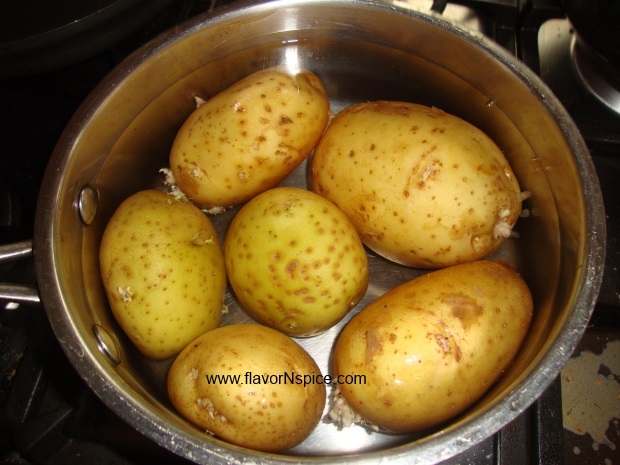 In a large pot pour 6-7 cups of water and boil the potatoes in it till they are completely soft (usually this takes 35-45 minutes over medium heat). 2. 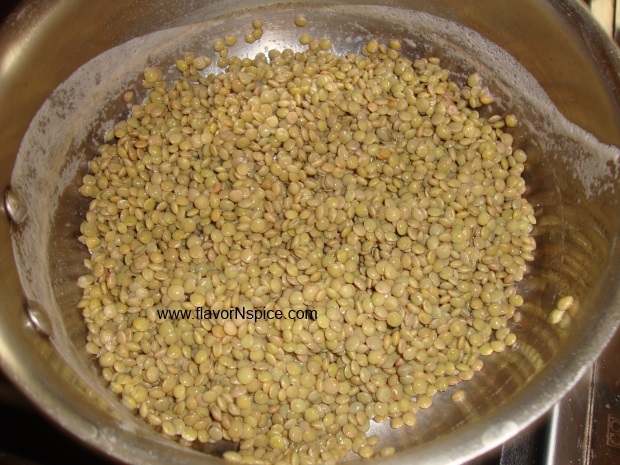 In a second pot (medium sized) cook the lentils in about 2-3 cups of water until they are fork tender (usually takes 20-25 minutes over low heat). 3. Place the lentils in a food processor and give them a rough grind. 4. Peel and chop the onion (fine dice). 5. 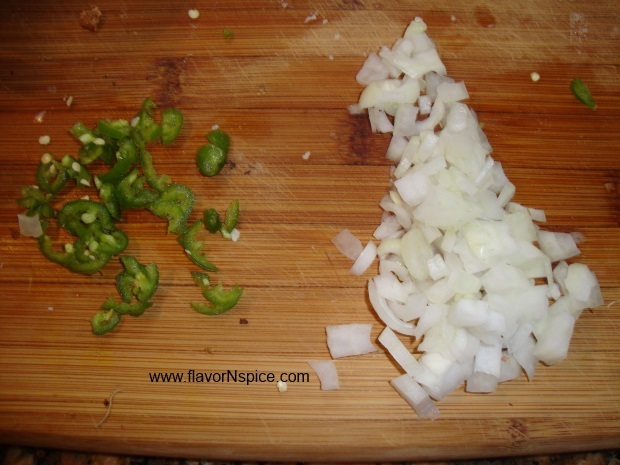 Finely slice the green chilies. 6. 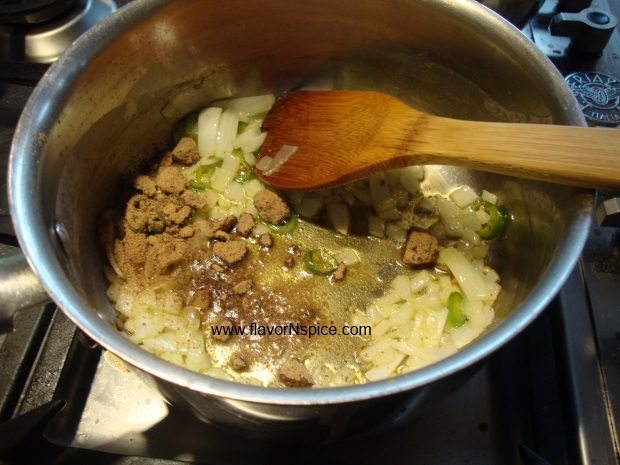 In a medium sized pot (preferable heavy bottomed) add about a tablespoon of olive oil and add half of the chopped onion and start cooking on medium heat (reserve the other half of chopped onion for use later). 7. 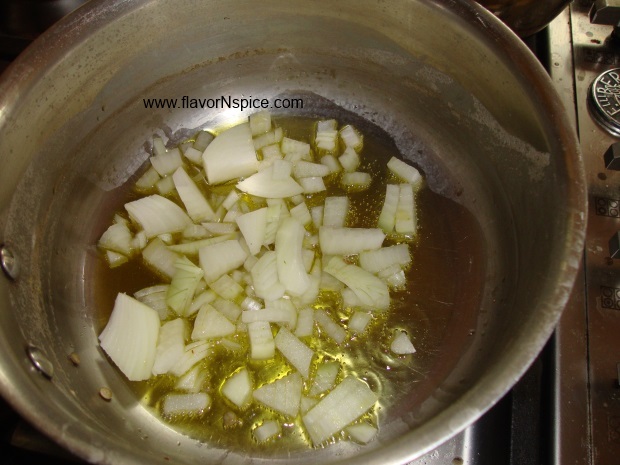 When the onions look translucent (takes 3-4 minutes), add half of the chopped green chili and cook for about 20-30 seconds. Keep stirring the contents of the pot. 8. Add half the Amchoor to the pot and stir. 9. 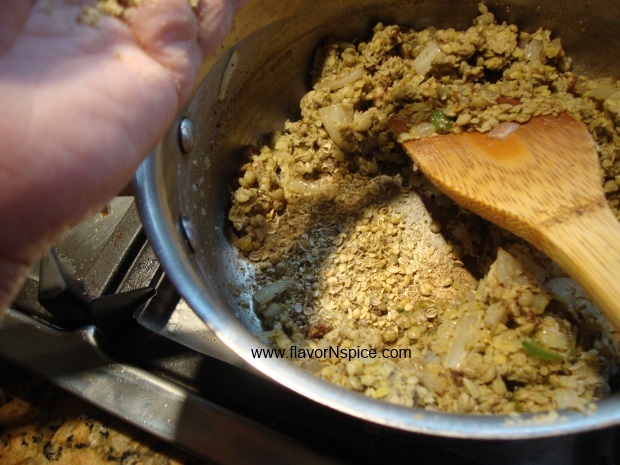 Add salt (to taste), 1.5 teaspoons of Amchoor and 1 tablespoon of ground coriander seeds to the pot and stir. Cook for 4-5 minutes (keep stirring frequently). Add the mashed lentils to the pot and stir. 10. 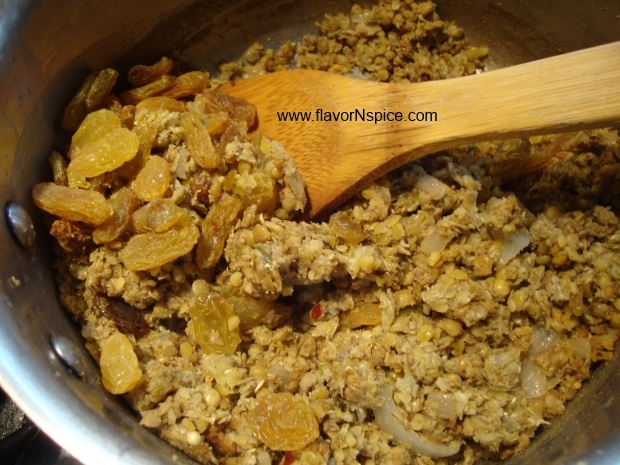 Add the raisins to the pot and stir. Switch the heat off. This is the stuffing for the potato pancakes and let this cool down a little bit. 11. 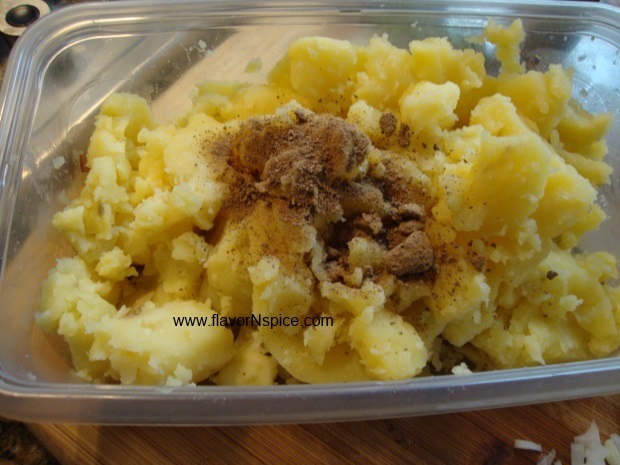 Now to prepare the potatoes, peel the cooked potatoes and mash them thoroughly. They should not be very lumpy. 12. 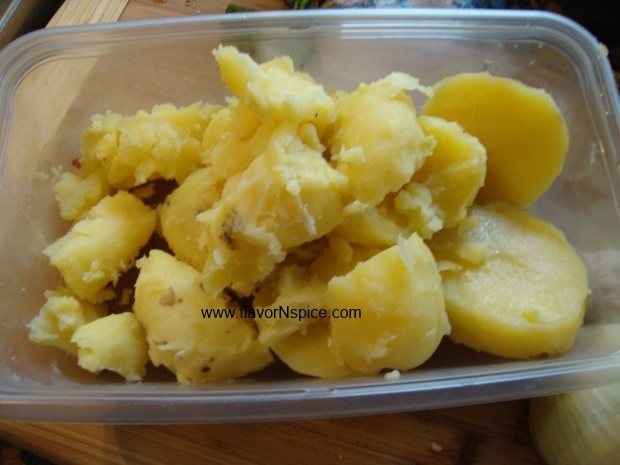 To the mashed potatoes, add salt (to taste), the remaining amount of Amchoor (1.5 teaspoons), the remaining amount of ground coriander seeds (1.5 tablespoons), the remaining amount of chopped green chili and the chopped onion. Mix everything together. 13. 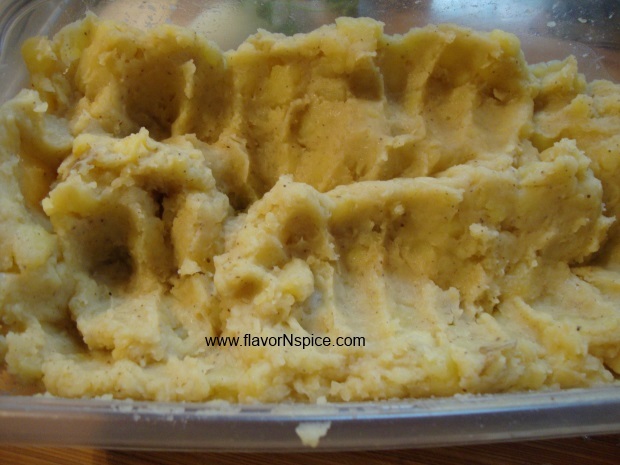 To the mashed potatoes, add the besan powder (or corn starch) and mix everything together. The Besan acts as a binding agent and prevents the pancake from breaking during the frying process. 14. To shape the pancakes, take about 2 tablespoons of the mashed potatoes and make a sort of flat cup in your hand. 15. In the middle of this potato cup add about a tablespoon of the mashed lentil mixture. 16. Add cover the top of the pancake with more mashed potatoes on top to make a stuffed ball. 17. Using your hands, gently flatten the pancake and shape it like a hamburger patty. Set this patty aside. 18. Repeat this process of stuffing and shaping all the pancakes and when all of them are done, start to cook them in a nonstick pan. 19. Heat about a tablespoon of olive oil in a nonstick pan (over low to medium heat) and place about 3-4 pancakes in it and cook them on both sides till the outside layer is dark and crispy. Flip the pancakes gently so that both sides are cooked but try not to break them during the flipping process. You’ll need to cook all the pancakes in a few batches. 20. 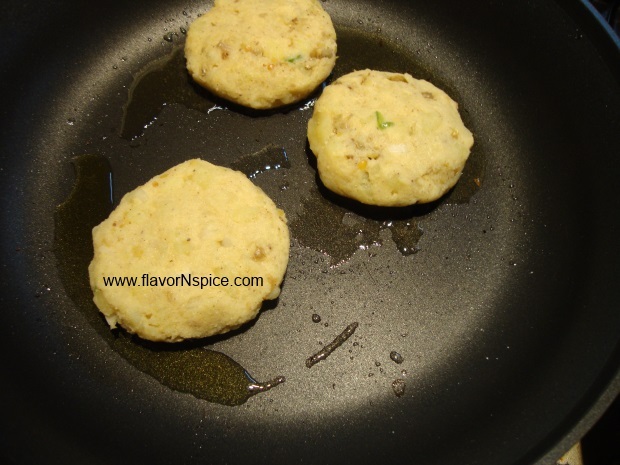 Serve the pancakes (Aloo Tikkis) while they are still hot. Serve them with a Mint Cilantro Chutney (grind 25-30 mint leaves, a bunch of cilantro leaves, one small shallot, juice of one lemon, one green chili, a small nub of fresh ginger, 1 teaspoon of salt and 1 tablespoon of sugar in a food processor) and Tamarind sauce (available at South Asian or Indian stores – I prefer the ones made by Deep Brand). 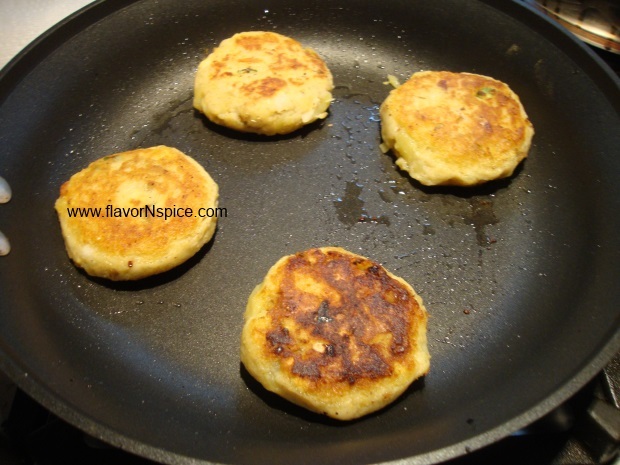 Yummm…you’ve now made me crave aloo tikkis. In Gujarat we call them “pattice” (I suppose a bastardization of patties) and my mother often stuffed them with “tuver na lilva” – little green pigeon pea-like legumes that are a pain to peel but taste wonderful. She always pan-fried them – I am surprised to read that in the north they are deep fried? Hi Shilpa – I don’t know the legumes you are talking about but in the north, we use cooked channa daal to stuff the tikkis. Some people also use mashed up peas. I used french lentils because I like their texture…they really turned out great and were eaten so fast my the hordes of kids/young adults at my place!!! Though the ones in Gujarat are smaller and more green than the ones shown here. 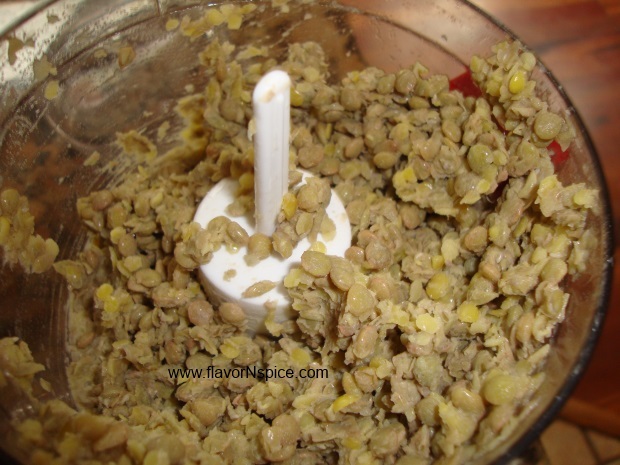 ahhh…I see what they are but I have never used pigeon peas. I know my friends from the Caribbean use them often and I have had them in dishes from the Caribbean but I have never used these in anything that I have cooked. We use peeled Channa Daal to stuff our tikkis (in the north). 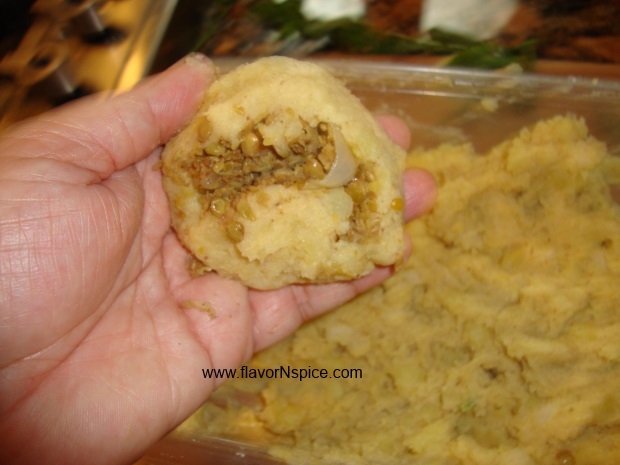 Maybe I should try the pigeon peas to stuff the aloo tikkis the next time – do you recommend them, Shilpa? totally – they are a real treat and people in Gujarat (well, at any rate, the people I know!) really like to use them when in season. 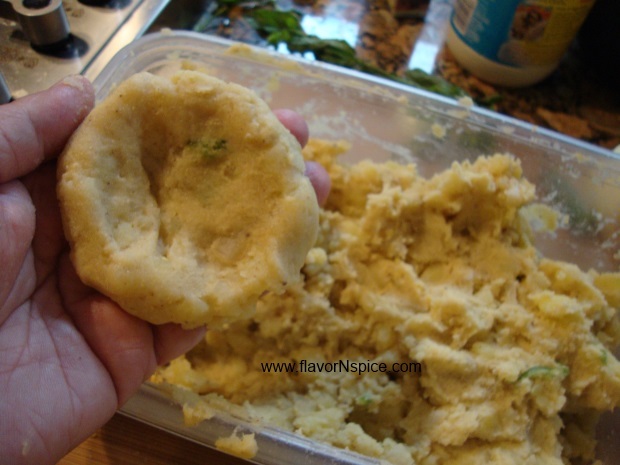 They are more traditionally a filling for kachoris – and an essential ingredient in that masterpiece “undhiu”. I honestly don’t know what the Caribbean variety tastes like – the grains seem bigger land less green than the ones I am used to, but how can it hurt to try?! hi Mary Jo – I have to warn you – they are highly addictive 🙂 also, if you can’t find the tamarind chutney at a South Asian store near you – let me know and I can tell you how to make it at home!